Apartments comfortable, tastefully furnished and equipped with all the facilities and comforts. 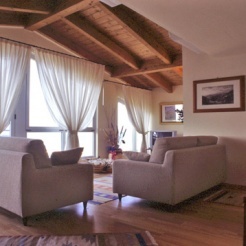 Places directly covered by the sea with views of the beaches and the lively marina area of Cattolica. The rooms of different types, are designed for families who want to spend a pleasant stay. Air conditioning, safe, dishwasher, microwave, satellite TV, telephone, videophone, video surveillance, security doors, fire protection service, laundry (washing machine and dryer), disabled access (elevator servo and scale), bicycles, parking, laundry service bedroom, bathroom, kitchen, beach service, concierge guardian.